You may have previously heard that Sage and V-Technologies would no longer have an OEM relationship where Sage resold the popular V-Technologies Starship software. 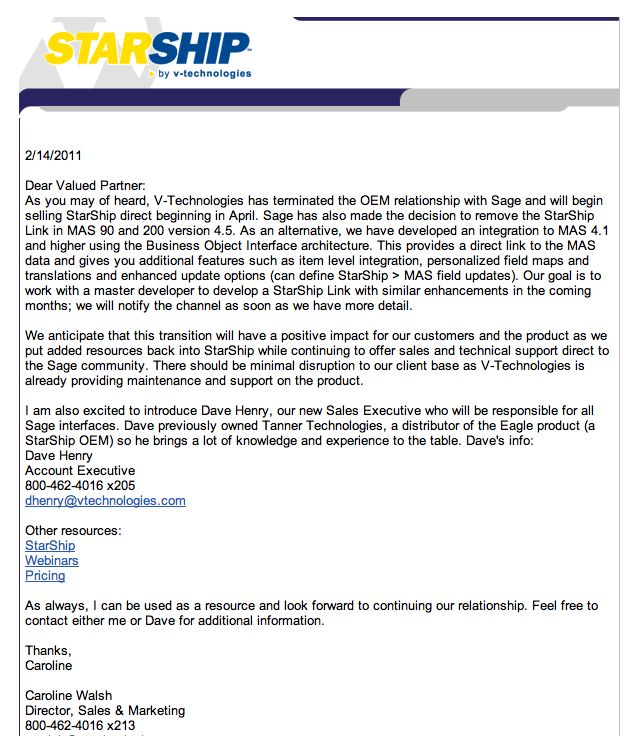 In an email blast sent out today, Caroline Walsh, the Direct or Sales and Marketing for V-Technologies shares that Sage will stop offering a Starship Link starting with version 4.5 of Sage ERP MAS 90 and 200. Instead it seems that V-Technologies will develop a link using Sage’s pseudo programming scripting language – Business Objects Interfact (BOI). They also mention that they’re actively seeking out a developer to create a link between Sage ERP MAS 90 and 200 and their Starship product. Should you abandon ship and switch to another shipping package? I don’t think solely based on this change in the relationship. V-Technologies has been doing a fine job for the last several years handling virtually all of their upgrades outside of Sage. If you’re looking for a new shipping solution and you use multiple carriers – Starship is still the more mature choice for most users. Do you need a Bill of Lading solution for your Sage MAS 90 or MAS 200 accounting software? How about one that will integrate directly to your Sage MAS 90 and 200 Sales Order data? 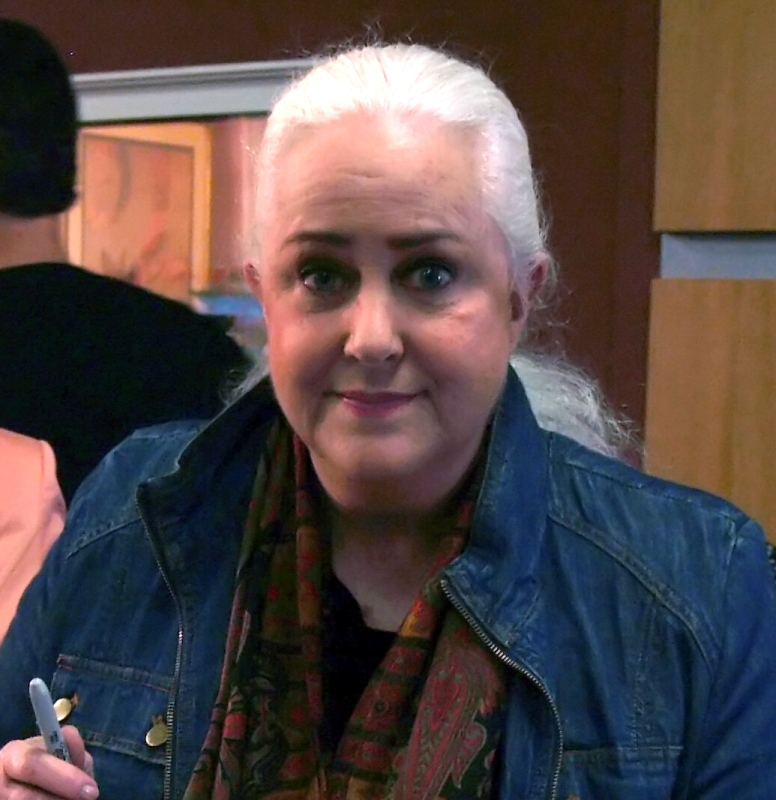 No … we’re not talking about the rock group. This is the Starship software program from V-Technologies that integrates rather seamlessly with MAS 90 and MAS 200 (version 4.1 or higher required for Starship Freight). Learn how V-Technologies newest product, Starship Freight, can help you ship via LTL common carrier and generate all the require paperwork including the most common Bill of Lading formats and even pallet labels. 40 minutes of live demonstration showing the product in action and integrated to Sage MAS 90 and 200. 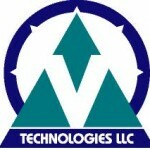 Caroline Walsh from V-Technologies will be presenting and I will host the Q&A as well as ask several questions of my own. The session is free – open to all – and lasts about an hour with time left at the end for your questions and Caroline’s answers. To enroll – follow this link. Starship Freight is a new module ($3,500 – single user / $700 add’l user / $2,500 five user) for Sage MAS 90 and MAS 200 that provides for shipments that utilize LTL trucking common carriers. One of the unique things about Starship Freight is that the software now replaces the Shipping Data Entry for nearly all activities (packing lists are still printed in the Shipping Data Entry module). 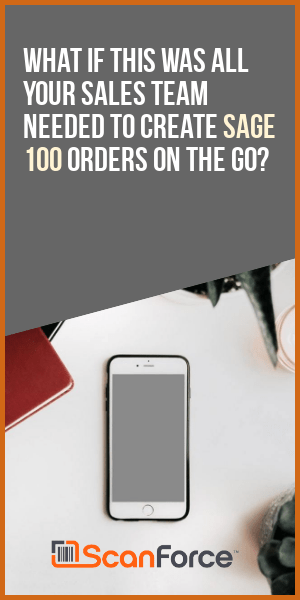 You may combine multiple Sales Orders into one shipment and then place that shipment within separate pallets and automatically notify the carrier that your order is ready for pickup. Here are some rough notes that I took during an hour long demonstration that was just hosted for one of my clients by V-Technologies. – one of the rating methods is freightquote.com for rating. 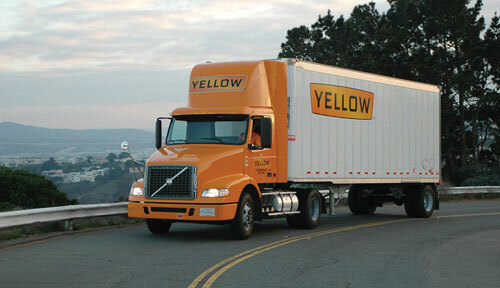 Can’t look up the rate ahead of time to quote the customer on freight — rating of the carrier is not required. Freight write back can be turned off if you quote the customer the freight in advance.